It was constructed sometime after the year 1000 on top of a pre-existent Oratory that had been built by St. Miniato, the first evangelizer and Christian martyr in Florence. Victim of the persecutions of the Emperor Decius (249-251 A.D.), Miniato is thought to have been an Armenian prince: the legend narrates that, after his decapitation, he picked up his head, put it back on his neck and went to die in a cave on Monte alle Croci, where he had lived as a hermit and where later the oratory and the church that bear his name were to be built. Construction on the temple, one of the finest examples of pure Florentine Romanesque architecture, first started in 1018, thanks to Bishop Ildebrando, and continued until 1207. 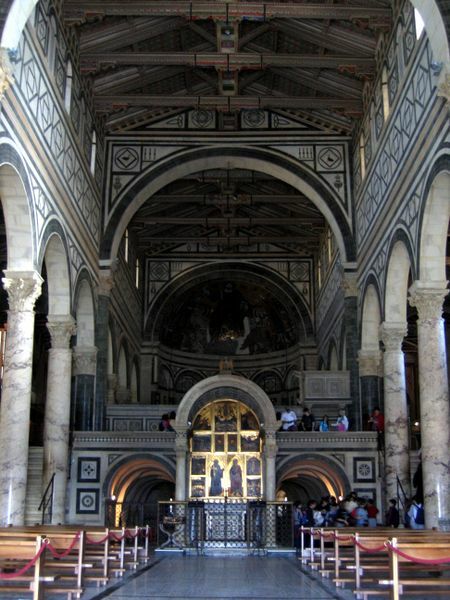 The facade was carried out in white Carrara and green Prato marble (12th-13th centuries) and divided into two orders linked together by rhombiform inlaid work, in allusion to the "opus reticolatum", the typical system used during the Roman Empire for building walls; it was also used by Leon Battista Alberti for the base of Palazzo Rucellai. The upper order is surmounted by a 13th century mosaic of the enthroned Christ in benediction between the Madonna and St. Miniato painted on a gilded background. The huge gilded copper eagle above it, placed on top of the pediment, is a symbol of the Arte di Calimala, which administered the wealth of the Benedictine convent from 1288. The spectacular facade of San Miniato was to inspire Alberti's completion of the facade of Santa Maria Novella in the 15th century and the covering of the facades of the Duomo and Santa Croce in the 19th century. The brilliant play of light that is created when the sun shines on the exterior of the monument, as well as that to be found in the interior of the apse, are alone enough to make it well worth while making this short trip outside the city centre. Palazzo dei Vescovi or the Bishops' Palace stands on the right, looking at the church; it can be visited by ringing at the door inside the church and is today inhabited by Olivetan monks, who also take care of the basilica. Remains of the ancient ramparts, with the bell tower built by Baccio d'Agnolo (1518), which looks almost like a fragment of some Roman fortification, stand on the left. This belltower, built to replace the original one, which fell down in 1499, was never completed; instead it was used for military purposes during the siege of 1529 at the suggestion of Michelangelo. Protected by mattresses and bales of wool, it was used as a base for the two cannon that were supposed to fire on the troups of Charles V. It still bears signs of the use it was put to today.